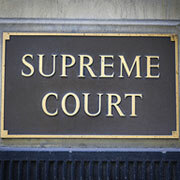 The Supreme Court often agrees to rule on questions upon which individual appeals courts have reached different conclusions, to create a uniform national legal standard. And that’s what the court did with a 5-4 decision in a case called Epic Systems Corp. v. Lewis. The basic question was whether the Federal Arbitration Act has greater authority over arbitration agreements between employers and employees than the National Labor Relations Act (NLRA). The court consolidated three similar cases in its ruling. In each case, employees had entered into agreements with their employers to resolve any labor disputes that might arise by arbitration, instead of taking the employers to court. Despite having signed those agreements, once disputes arose affecting the individuals and their coworkers, the employees argued that the agreements weren’t valid. Why? Because, the employees alleged, those agreements prevented them from participating in a class action lawsuit, which they argue is a “protected activity” safeguarded by the NLRA. For the last six years, the National Labor Relations Board (which plays a key role in enforcing the NLRA) has taken the position that employees’ ability to pursue a class action case is a “protected activity” and supersedes the Federal Arbitration Act. The majority Supreme Court opinion written by Justice Neil Gorsuch essentially concluded that the basic goal of Congress when it adopted the NLRA was to enable employees to form labor unions. On that basis, the protected activity that is sheltered by the NLRA is about union building and is unrelated to arbitration agreements. This ruling doesn’t give employers a blank check, however, in how they introduce arbitration agreements into their employer-employee dispute resolution programs. Rather, it declares that arbitration agreements that preempt class action litigation aren’t intrinsically illegal. How you put them in place matters a great deal as to whether they will hold up in court, if challenged. Why would you want to have employees accept mandatory arbitration in the first place? Arbitration enables a dispute to be resolved more quickly and inexpensively than it generally would be in the court system. When sued and taken to court by a disgruntled employee, even with a dubious claim, many employers decide to settle the case just to make it go away and save money. But with arbitration, that isn’t necessary. Because the process is relatively inexpensive, it’s easier to stick to your guns and defeat claims that are found to be bogus. To be clear, arbitration doesn’t guarantee an employer will come out on top in a dispute. Chances are if you would lose in court, you’d probably lose in arbitration. But at least the process would typically be much faster and less costly. To make arbitration agreements hold up to a potential legal challenge, attorneys recommend that you take several precautions. One is to make it a stand-alone agreement that the employee signs, versus having it just be one of many pieces of a longer employment agreement. This way it would be tough for an employee to claim he or she wasn’t aware of having agreed to arbitration. It must be clearly stated that the agreement is mutual — that is, it applies equally to the employer and the employee. It’s also important that the agreement provide general guidance on the categories of disputes that it covers. For example, arbitration might not be the best way to deal with a dispute involving theft of company property. Payment of arbitration fees. You might agree to cover all the fees associated with an arbitration unless the dispute involves a highly paid executive. Courts have occasionally raised concerns about requiring employees to split these fees on the basis that this might make the use of arbitration unworkable to an employee (except where the plaintiff’s attorney would work on a contingency basis). “Severability” clause. Such a clause says that if one part of the agreement is deemed invalid, that part can be thrown out without shooting down the entire agreement. Limits on statutory remedies. In cases where employees prevail but the agreement includes caps on the awards to employees, courts have at times rejected such agreements if using the judicial system would’ve resulted in higher awards. Whatever provisions you incorporate into an arbitration agreement, the goal is to avoid problems if an employee challenges its validity in court. Standards will vary by jurisdiction and according to the level of risk you’re willing to assume. A qualified labor attorney can walk you through the entire process, from considering whether you want an arbitration agreement to drafting the agreement itself if you opt to use one.